Dr. Daniel Zwillinger is a Senior Principal Systems Engineer for the Raytheon Company. He was a systems requirements “book boss” for the Cobra Judy Replacement (CJR) ship and was a requirements and test lead for tracking on the Ungraded Early Warning Radars (UEWR). He has improved the Zumwalt destroyer’s software accreditation process and he was test lead on an Active Electronically Scanned Array (AESA) radar. Dan is a subject matter expert (SME) in Design for Six Sigma (DFSS) and is a DFSS SME in Test Optimization, Critical Chain Program Management, and Voice of the Customer. He is currently leading a project creating Trust in Autonomous Systems. At Raytheon, he twice won the President’s award for best Six Sigma project of the year: on converting planning packages to work packages for the Patriot missile, and for revising Raytheon’s timecard system. He has managed the Six Sigma white belt training program. Prior to Raytheon, Dan worked at Sandia Labs, JPL, Exxon, MITRE, IDA, BBN, and The Mathworks (where he developed an early version of their Statistics Toolbox). For ten years, Zwillinger was owner and president of Aztec Corporation. As a small business, Aztec won several Small Business Innovation Research (SBIR) contracts. The company also created several software packages for publishing companies. Prior to Aztec, Zwillinger was a college professor at Rensselaer Polytechnic Institute in the department of mathematics. Dan has written several books on mathematics on the topics of differential equations, integration, statistics, and general mathematics. He is editor-in-chief of the Chemical Rubber Company’s (CRC’s) “Standard Mathematical Tables and Formulae”, and is on the editorial board for CRC’s “Handbook of Chemistry and Physics”. 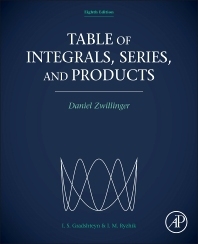 Zwillinger holds a bachelor's degree in mathematics from the Massachusetts Institute of Technology (MIT). He earned his doctorate in applied mathematics from the California Institute of Technology (Caltech). Zwillinger is a certified Raytheon Six Sigma Expert and an ASQ certified Six Sigma Black Belt. He also holds a pilot’s license. This is my number one go-to for difficult math integrals.